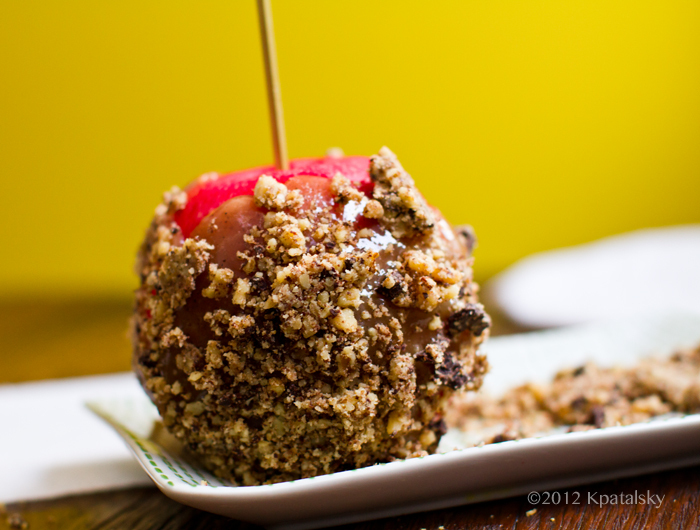 (updated post) These Easy Vegan Caramel Apples are perfect for Halloween and/or your fall apple harvest. 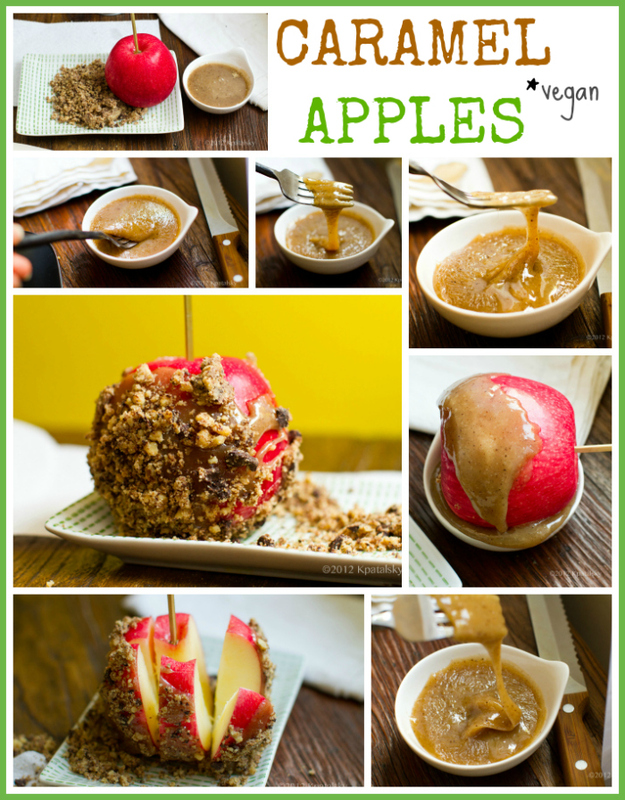 And despite what you may think about "vegan caramel" this recipe couldn't be easier! In fact, there are just two main ingredients and this caramel can be made in a matter of minutes!.. 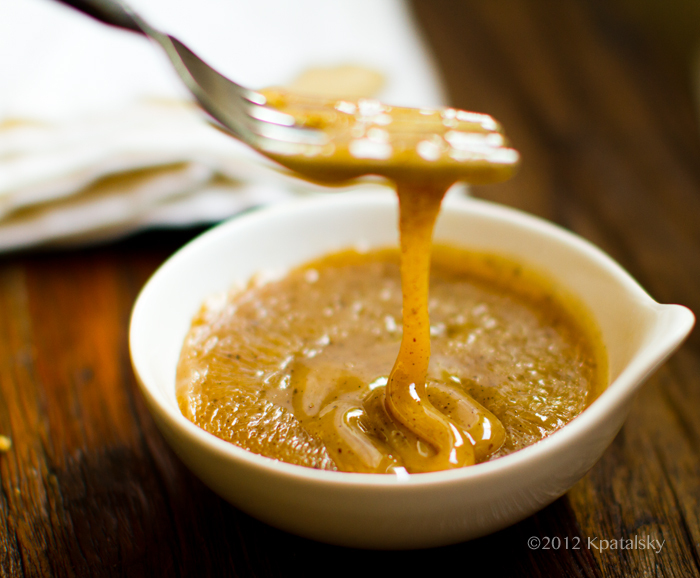 Coconut Caramel Sauce. This dip is one of my absolute favorite recipes. I make it every fall and it always makes the house smell amazing. Seriously. If you are throwing a party, make one batch ahead of time to give it some time to chill and make one batch right before your guests arrive so the house smells like caramel heaven. 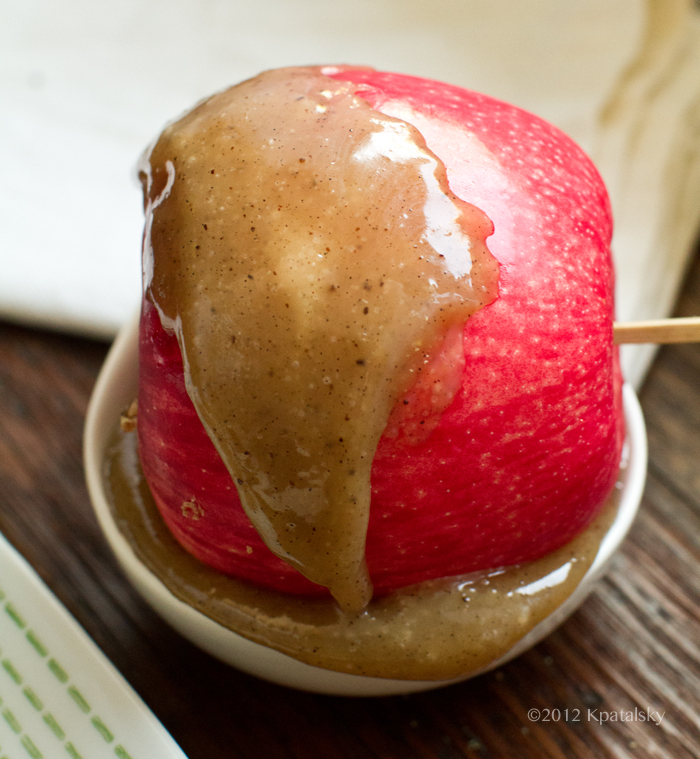 The main question that I always have about caramel sauce for apples is: Will it stick???? The honest answer for this question is sort've. If you are used to a super sticky traditional candy caramel, the kind that sticks between your teeth and might pull a filling if you are not careful, then this caramel will not be equal in measure. And in that case, I would suggest buying some vegan Cocomels Coconut Caramels and melt those for super sticky, melted candy caramel. 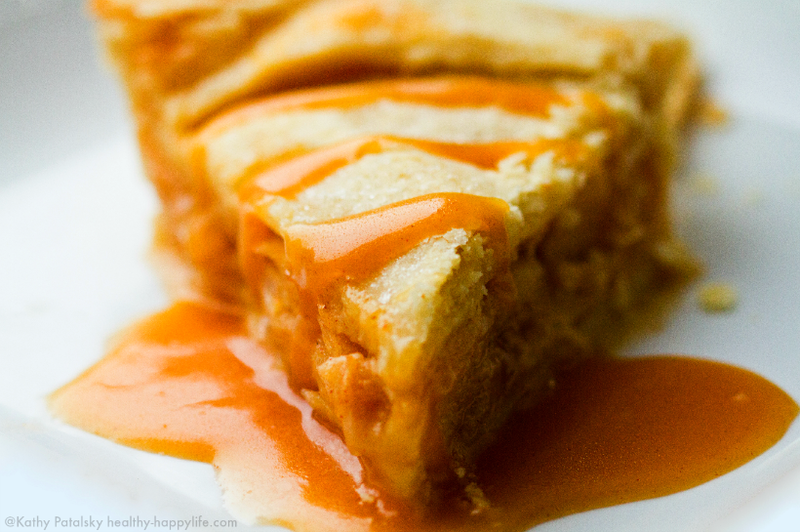 But if you are open to a more sauce-like caramel with a wonderful sticky texture, ah-mazing swoon-worthy caramel flavor and intoxicating aroma, well, this sauce is perfection. Remember, there are literally just TWO main ingredients in this caramel, so we are really cutting down on added gunk, gums and also time in making things! - Bubbly time. Make sure you allow the caramel to boil and bubble at max heat for a long enough time, and also to simmer on low for long enough time too. A good timeframe: about one minute on high and three to four minutes on low. Never stop stirring with a wooden spoon! You do not want to burn the caramel, just candy it a bit. - Chill time. 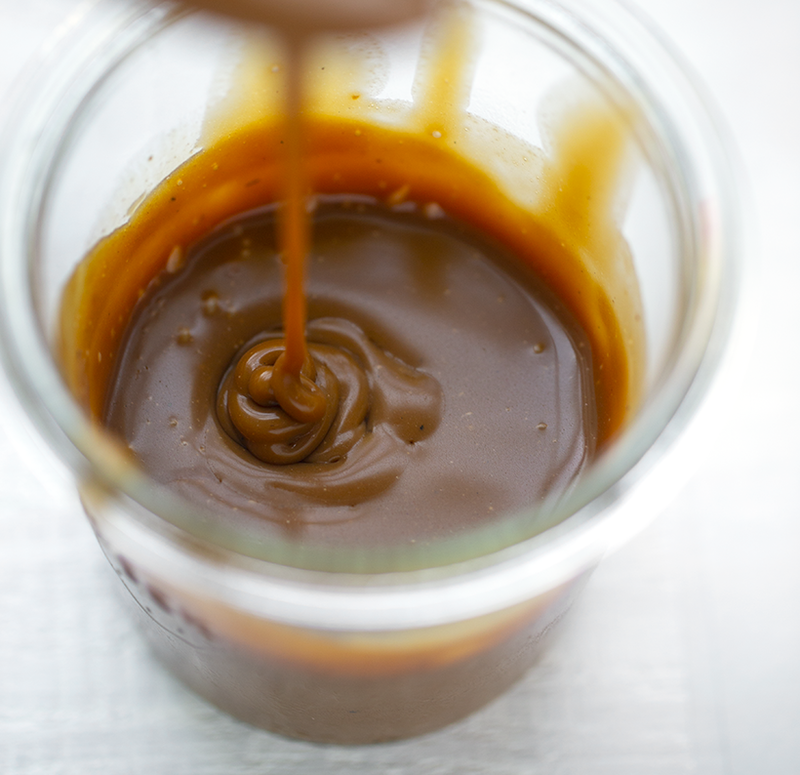 Chill your finished caramel sauce in the fridge for a long enough time to allow it to get super sticky. 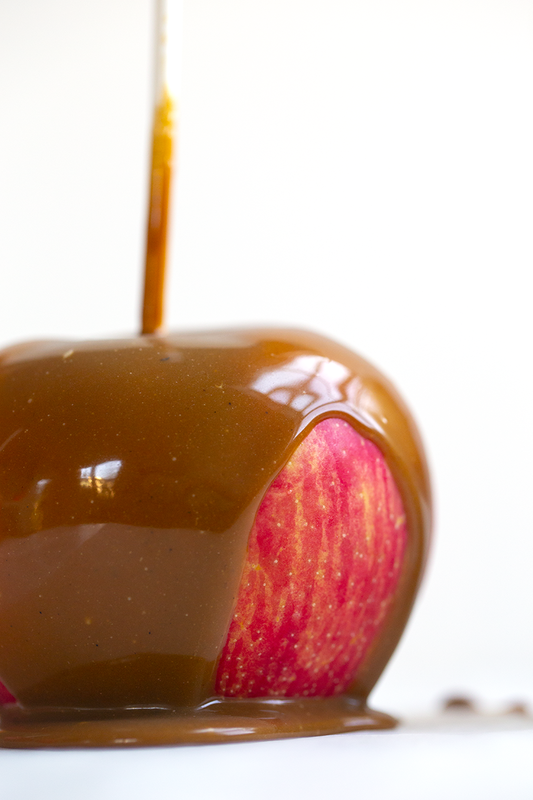 At least 24hrs is ideal for using this caramel for caramel apples. If you are just using this caramel as a caramel sauce or dip just an hour in the fridge should do it. Or if you are using it for warm sauce, straight from the stove works! So good on bananas, ice cream sundaes and even apple pie! 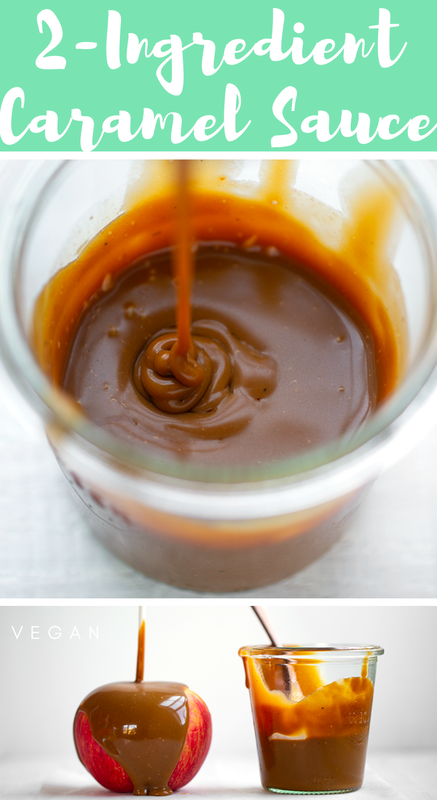 This silky, rich, fluffy, sticky vegan caramel sauce is made using just two main ingredients: coconut sugar and coconut cream from coconut milk! **** Another vegan sugar can be used if needed. Try turbino raw sugar. Larger sugar crystals will take longer to melt though. Add the ingredients to a small sauce pan over low heat. 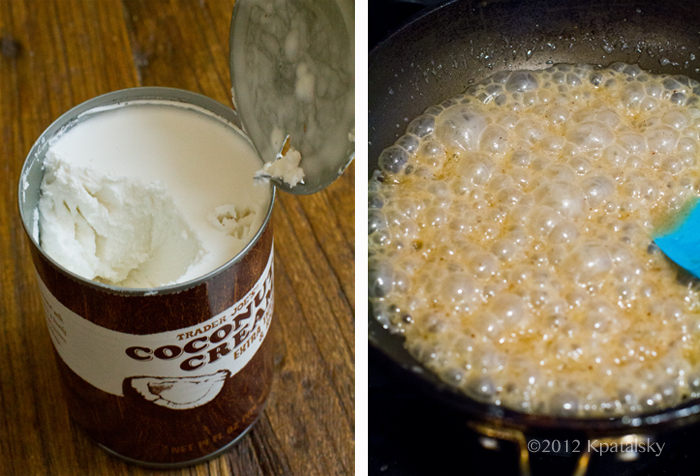 Stir with a wooden spoon until the coconut cream has melted. Turn the heat to high and continue stirring briskly until the mixture reaches a brisk boil. Stir as the mixture bubbles for about 30-60 seconds. Then reduce the heat back to low. Continue stirring, over low heat for another 2-4 minutes. Pour the caramel into a small cup and place in the fridge. Allow the caramel to chill at least an hour before serving as a dip or drizzle. For sticky caramel, allow the caramel to chill overnight. 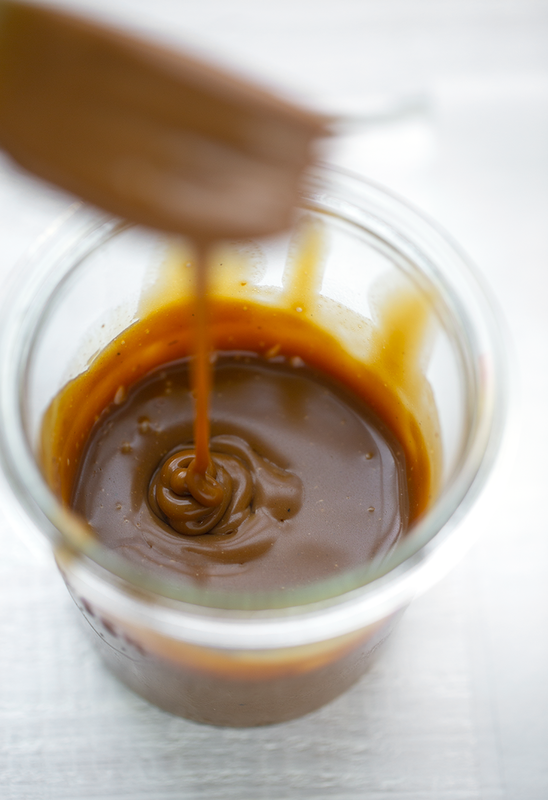 Tip: For super sticky caramel, allow a few more seconds over high heat and another minute or so over low heat. Photo + Sugar Note: The caramel that is used for the walnut-covered caramel apples was made using raw turbino sugar, thus why it has a lighter color and is slightly stickier. 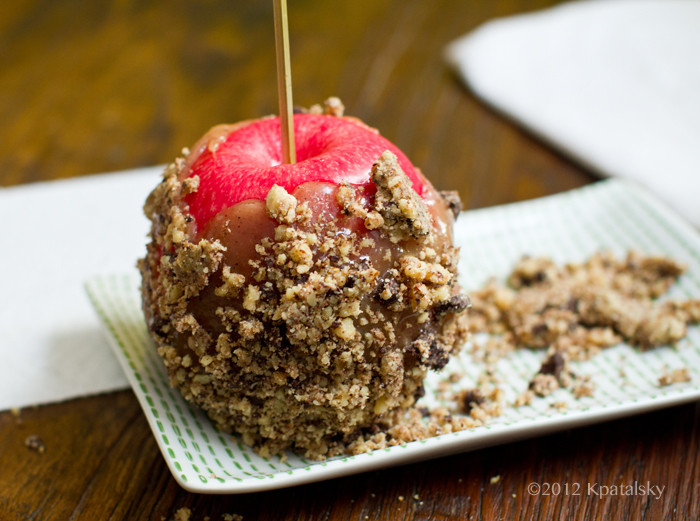 The darker colored, more opaque, burnt brown caramel was made using coconut sugar. In recent years I have come to prefer the coconut sugar version simply for the strong amazing aroma. But both versions work! This caramel is also delicious when used on my Caramel Apple Pie..
Alright, ready to make caramel apples with chocolate and walnuts? Let's do this thing. You will need.. 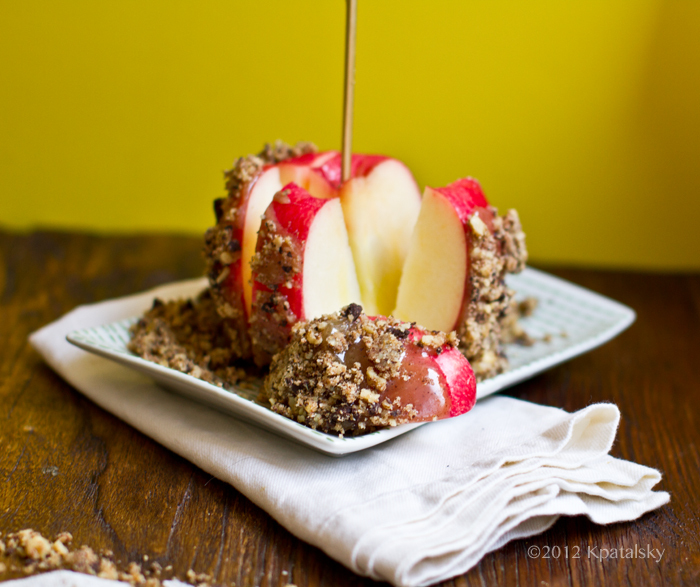 I've been ogling the caramel apples all over the web the past week and decided that I needed to make this happen here on my blog. I have experimented with vegan caramel in the past - like my vegan apple cider caramel - but this time I wanted to keep my recipe super simple and access the brilliance of coconut products. So instead of heavy cream or milk (which is found in most non-vegan recipes) I grabbed some vegan coconut cream. coconut cream - full fat coconut milk, chilled, then the firm white stuff that forms at the top of the can or bowl is the "coconut cream"
Vegan Vanilla Bean Coconut Caramel..
As I was skimming around other vegan caramel recipes I noticed that many of them get very precise regarding temperatures and boiling points etc etc. It all makes it sound very intimidating, especially to someone like me who does not own a candy thermometer. So I gave my "super easy, guess-ti-mation timing" version a whirl and it totally worked. I made a few different batches, using different times for "boiling" and again, it worked. So while precision is totally awesome if you have the patience and skills and tools. I personally found that winging it kinda works here. 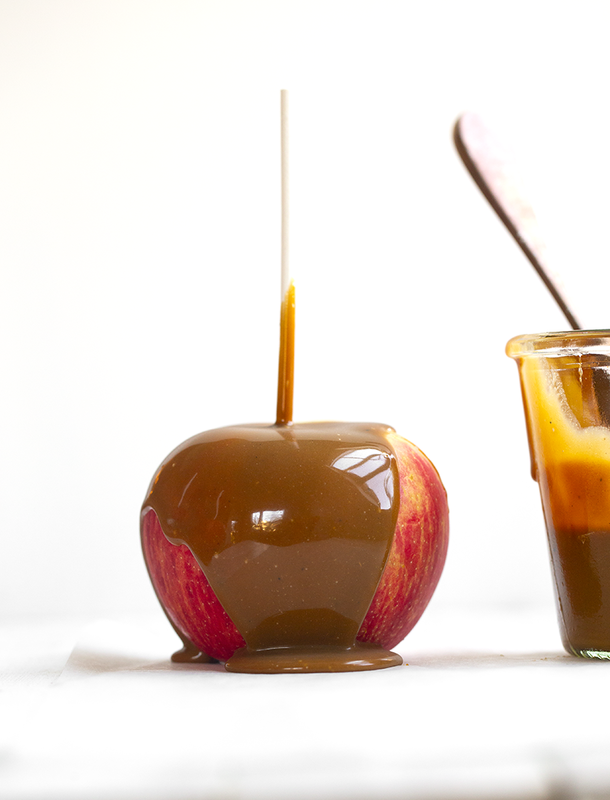 Making vegan caramel a lot easier than you may think. The topping / coating? You can really do whatever you'd like. Peanuts, chopped pecans, dark chocolate, walnuts, brazil nuts or even go all healthy and throw in a few chia or hemp seeds. I did a simple walnut + dark vegan chocolate mixture. Very yummy. 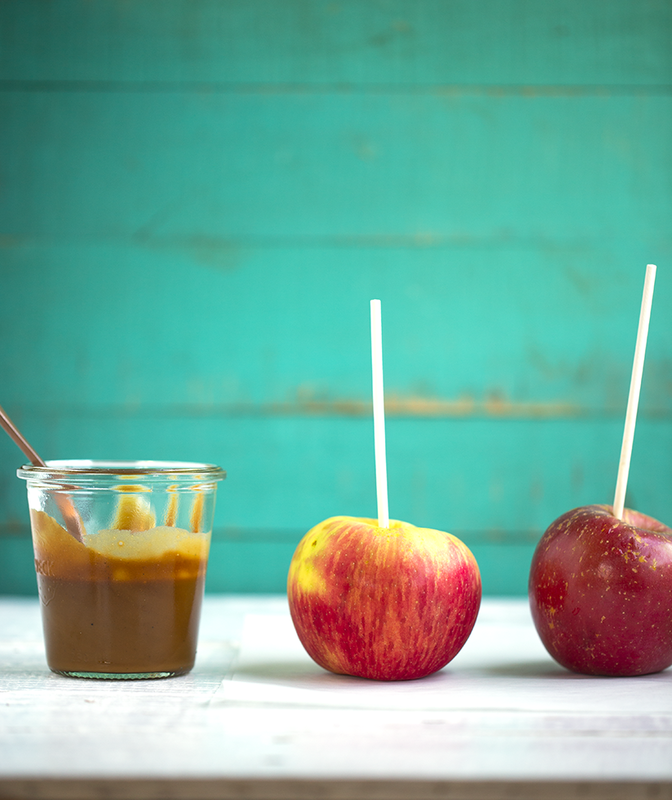 Dip apple in caramel - slather it around. Then dip in coating. 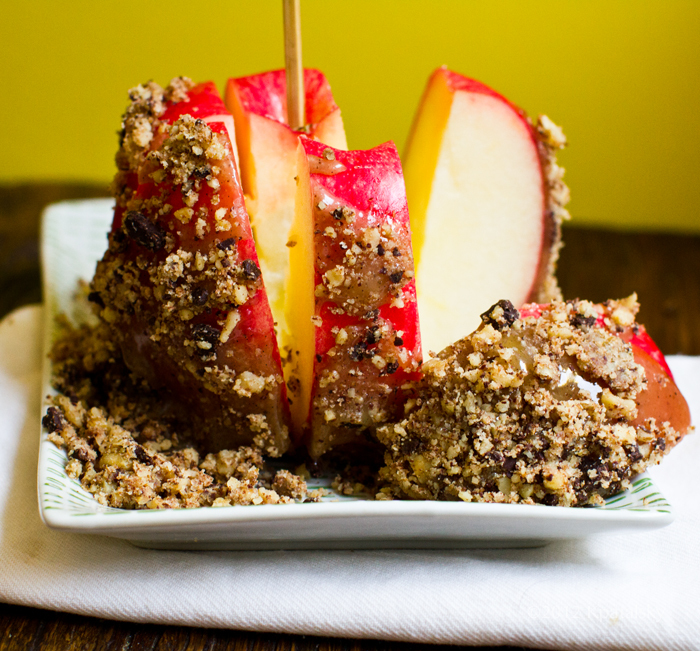 Place on parchment paper and place in the fridge to chill, or serve right away. * If caramel is too thick when you pull from fridge, stick in the microwave for a few seconds to soften. * If caramel does not firm up in the fridge, wait until fully chilled, it should be firm. If not, start over and heat the caramel mixture a minute or so longer at the boiling state. You may be able to simply reheat the same mixture. 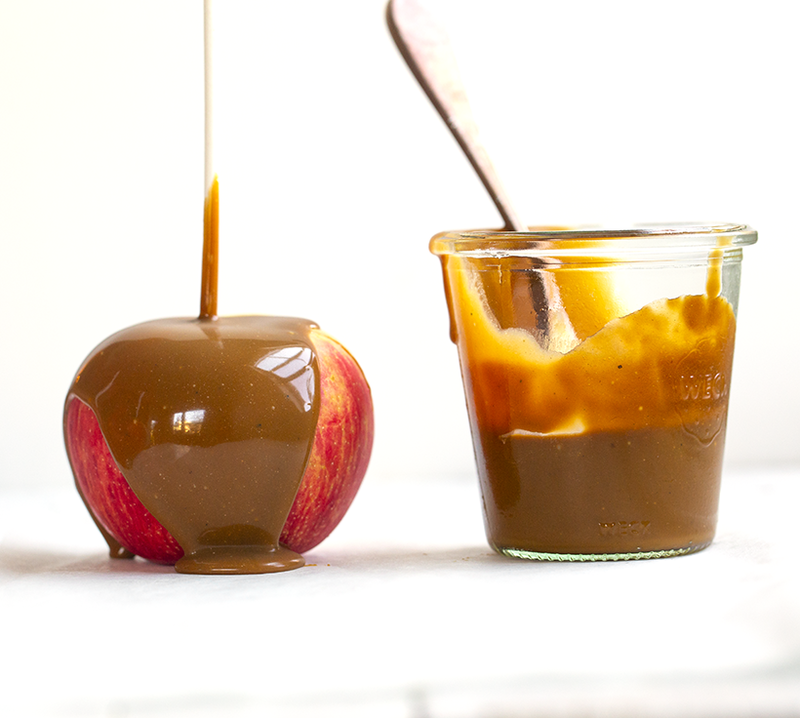 * If caramel seems grainy, you need to melt/heat it for a longer period on the stove. * If mixture seems too thick as you are heating it, add another spoonful of coconut cream. 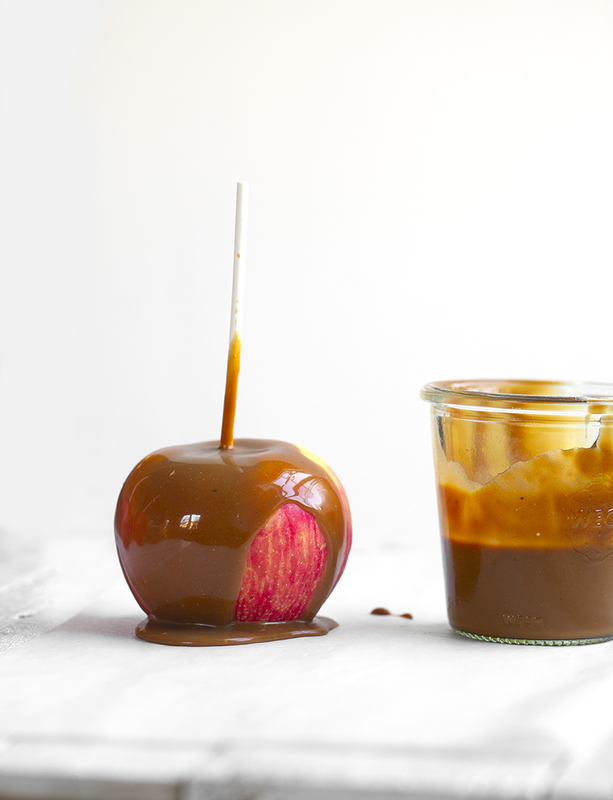 * If caramel does not stick to the apple, place it back in the fridge, it probably needs to chill a bit longer to get stickier. OR your apple is too wet. Dry it off very well.